Today I had to visit a client, while waiting for him we were led into the "ballroom" where me and the account handler sat and waited. The ballroom (thats what they called it) is really interesting. The place hasn't be decorated since they first opened the office back in the 70s or 80s. The place was like retro heaven. 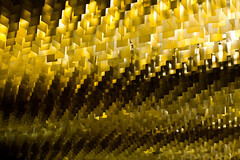 The ceiling which is todays picture is amazing. I really love it. Then the sofas, the desk, all of it looked 30 years old. Everything was in excellent condition, just the style is 30 years old. Actually whats ironic is this retro look is trendy now. The only new addition to this room was a large 60inch plasma at the far end. Another thing I loved were some of the paintings. I asked the chairman later who had painted them and he told me a painter called Ibrahim Ismail did them over 24 years ago. I couldn't believe it. The paintings I saw looked very trendy. They were paintings of the local culture, one for example was an old souk, the other of some bedouin men, and they all had this style I hadn't seen before. The painter uses a lot of straight lines, its hard to explain so I googled a bit and managed to find a picture of one painting where you can see what I am talking about. Click here to see it. I really love this guys work and I am now interested in finding out more about him. When I left the meeting the chairman was very nice and gave me a souvenir to take with me. It was a hand painted pot from Portugal filled with honey. A very nice item I will probably display in my living room.